This blog has an internal statistics page which reports a daily compilation of the number of “visits” to the current posting. The same page also reports on visits to previous postings. A few days ago I noticed a few “visits” to the January 20, 2009, Wall Writings posting. 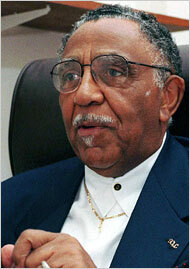 Obama’s speech was followed by a benediction from 87-year-old [The Reverend] Joseph Lowery (above), from Atlanta, Georgia, whose opening words must have sounded familiar to the millions of African Americans in the crowd and around the nation. Lowery’s prayer began with the third verse of James Weldon Johnson’s hymn, “Lift Every Voice and Sing”, which, since it was written in 1920, has emerged as the “national anthem” of the African American community. James Weldon Johnson’s words are significant today because pessimism surrounds the peace talks. Until we hear further from the negotiations participants, we must wait to see how the occupier and the occupied resolve, for the time being at least, how they will live together. It is in this time of waiting that I decided to set out on a journey that begins with Johnson’s hymn. On the internet journey I followed a path that led to another eloquent African-American author, Alice Walker. Novelist and poet, Walker has written more than thirty books, the best known of which is her Pulitzer Prize winning novel The Color Purple. In one of the speeches she delivered to a Palestinian audience during a visit to Ramallah, Walker described her encounter with Israeli border guards when she traveled from Amman to the West Bank by way of the Allenby Bridge. As the hours of interrogation dragged by at the Allenby Bridge, Walker finally asked one of the young Israeli soldiers peppering her with the usual irrelevant questions, have you ever heard of the novel, The Color Purple. The soldier had not heard of the novel nor the film based on the novel, even though the film was directed by Steven Spielberg, an Israeli favorite. After that visit, which was organized by TEDxRamallah, Walker tried to enter Gaza on a different mission. In June, 2011, Walker was among 38 people aboard the ship, Audacity of Hope, one of the ships which tried, and failed, to sail from Greece to Gaza to break the Israeli maritime siege of Gaza. Israel prevailed on Greece to prevent the ships from sailing. My co-passengers [including Alice Walker] and I, of the U.S. Boat to Gaza. have now gone from “High-Seas Hippies,” according to the right-wing Washington Times, to participants in a flotilla full of “fools, knaves, hypocrites, bigots, and supporters of terrorism,” says Alan Dershowitz in his usual measured prose. In Israel, there is credible speculation that Netanyahu agreed to new peace talks, notwithstanding the strident rejectionism of his closest coalition allies, because he is beginning to grasp the growing alienation of the international community over Israel’s unyielding occupation and settlement policies. The recent decision of the European Union to cease all EU expenditures for Israeli activities in the occupied territories was a shock to Netanyahu. It may have prompted his sudden willingness to yield to negotiations. Not a bad day’s work for a group of what Alan Dershowitz calls, “fools, knaves, hypocrites, bigots, and supporters of terrorism,” since we may assume that anyone working to end the occupation falls into the Dershowitz condemned bucket. There is no doubt that [Israeli columnists] [Gideon] Levy and [Uri] Avnery have sensed the presence of a “hidden mechanism” of change in Palestine. It is a change happening in Ramallah, Palestine’s temporary capital, and in the rest of the West Bank, the Golan Heights, and in Gaza. My journey following the path of Alice Walker turned up many examples of the gentle manner in which this remarkable woman stands for justice for the Palestinian people. For example, she is an avid supporter of the BDS (Boycott, Divestment, Sanctions) movement. For those who would like to earn extra credit in this journey to discover more about Alice Walker, there are two in-depth interviews of Walker by Amy Goodman on Democracy Now. You may access these interviews, Part One here and Part Two, here. Finally, in following the path of Alice Walker through the internet, our journey brought me home to Georgia, to my own alma mater, Emory University. 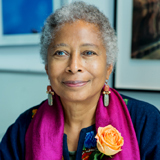 Alice Walker placed the archive of her work in the Manuscript, Archives, and Rare Book Library of Emory University in 2008. The Walker Archive was opened in 2009. One video from the evening honoring Walker features historian-activist Howard Zinn who initially met Alice Walker at Spelman College in Atlanta where he was her teacher during the 1960’s. To view that video, click here. The Emory event honoring Alice Walker closed with the singing of James Weldon Johnson’s “Life Every Voice and Sing,” the African-American “national anthem” with which we began this journey. In this way, the circle closes, from James Weldon Johnson, to the Rev. James Lowrey, to President Barack Obama, and finally to Alice Walker. The young man who leads the singing that closes the evening is an Emory graduate, class of 2011. His name is Garrett M. Turner. He is currently pursing further graduate work at the University of St. Andrews in Scotland. The circle grows, regardless of the outcome of the current “peace talks” negotiations. This entry was posted in -Archive 2008, Middle East, Middle East Politics, Netanyahu, Obama. Bookmark the permalink. As the most recent negotiations put us onto a hamster wheel, I want to thank you James for taking us into this inspiring journey. If we had a handful of the likes of Alice Walker these days, I am sure the whole Middle East, the US and the world will be in a much more stable and peaceful situation. Thanks for the focus on Alice Walker and her journey. As to the “negotiations”, the US is making it clear to both the I’s and the P’s that this is the last time the US will play midwife to the birth of a Palestinian State alongside Israel. Israel has paid lip service to the idea for a long time, but with no head, heart, hands or feet. What “pressure” the US has in mind remains to be seen, but we hope it isn’t the blank check mode which has been in operation for too long. I agree that the EU decision to stop funding projects in the settlements on historic Palestinian land really got Bibi’s attention. Whether he can transcend his own deep-seated convictions about Israeli supremacy over all the land, and control his own coalition teammates remains to be seen. Everyone (well, almost everyone) knows that the alternative is surely a bi-national State with Palestinians gaining more citizenship rights (which will threaten the Jewish character of Israel). No one (including most Palestinians I know) seems to want that. So Israel is caught between a rock and a hard place. Many of us wonder what she will do. We will learn soon enough as the “talks” proceed. This morning I read your newest post in Wallwritings. I am reminded of how long the road is and will be, and that even in the smallness of personal or denominational politics that can side-swipe any of us, there is always the call to justice, to hope, to keeping faith with the movement, to lifting up one’s voice and placing feet on the ground in solidarity. Your words are water to desert spirits. I am very grateful for your witness. The one that reflects on the BDS movement and its efforts to reach Gaza include these lines: “”Rosa Parks sat down in the front on the bus….It is time for us, en masse, to show up in front of our conscience, and sit down in the front of the only bus we have: our very lives.” (p.279). Thanks to Alice Walker and to you for bringing us inspiration for the journey. I am reminded of a later line in that verse “Lest, our hearts drunk with the wine of the world, we forget Thee” When President Obama disappoints me I reflect on these lines. Thank you James for this blog and your unwavering support of the Palestinian people. I did not know the African American Anthem but was very touched by the words and song. In many ways it fits our situation and reminds me that there is always hope we might also come out of a gloomy past. Keep well and keep writing.